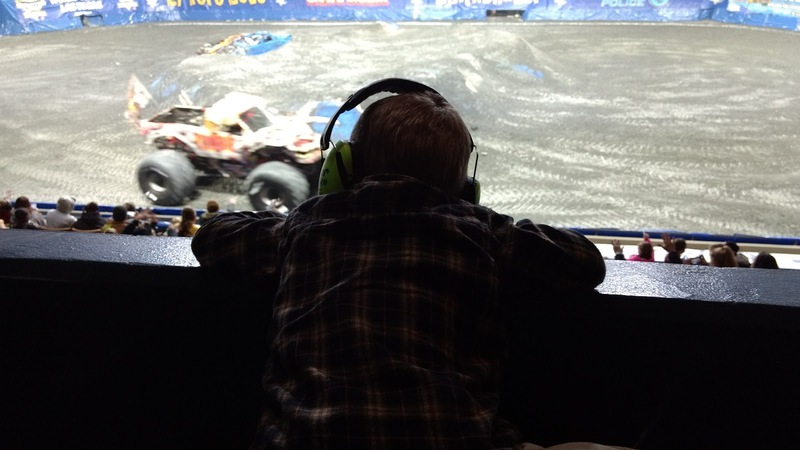 My Thought Orchard: Monster Trucks! Monster Jam is a traveling monster truck show, and you can try to guess which two lucky guys got tickets for Christmas. We went last night and had a blast! 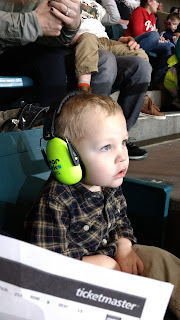 My previous exposure to monster trucks was limited to the smash hit "He's a Monster" on Truck Tunes, so it was a brand new experience for both of us. Some things were expected and others were surprises. At least a third of the audience was under six years old, and half of those were sporting cool earmuffs like Jace got to wear. It was a good idea to get those--the trucks were very loud, and you may remember that we had to leave early from a baseball game last year after the crowd cheered too much. With the "ear muffins," as he likes to call them, Jace was enthralled. There were 8 drivers competing in a half dozen races and stunt routines. They each drove three different vehicles: a monster truck, a four wheeler, and a speedster (basically an ATV with cab and crash bars). In addition, we got to see several loaders, forklifts, and other trucks. They all came out during an intermission to repair/reconfigure the obstacle course, and one specialty truck got to come out several times to help right an overturned truck. 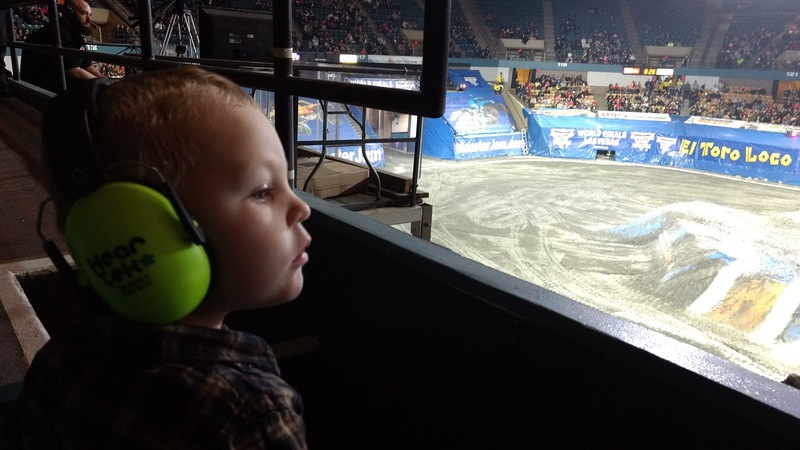 As truck tunes will tell you, monster trucks do "wheelies, and donuts, and jump after jump!" The trucks are all functionally identical, with the same motors, wheels, and shocks under their fancy exteriors, so I was a little surprised that three of the drivers were consistently better at almost everything. A few of them just looked like they were bouncing over dirt mounds and turning in circles, while the better performers had impressive jumps and exciting spins. 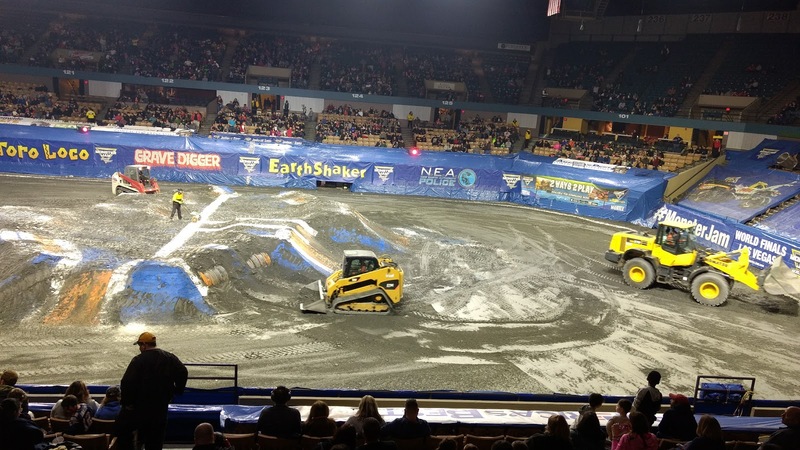 I guess I expected the truck's design or power to be the major factor, but it turns out that smashing things in a monster truck takes some actual skill. 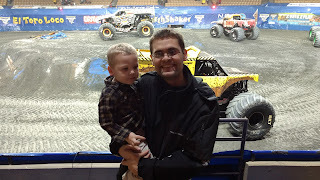 A big thank you to Kelley for the present so we could have an awesome boys' night out!